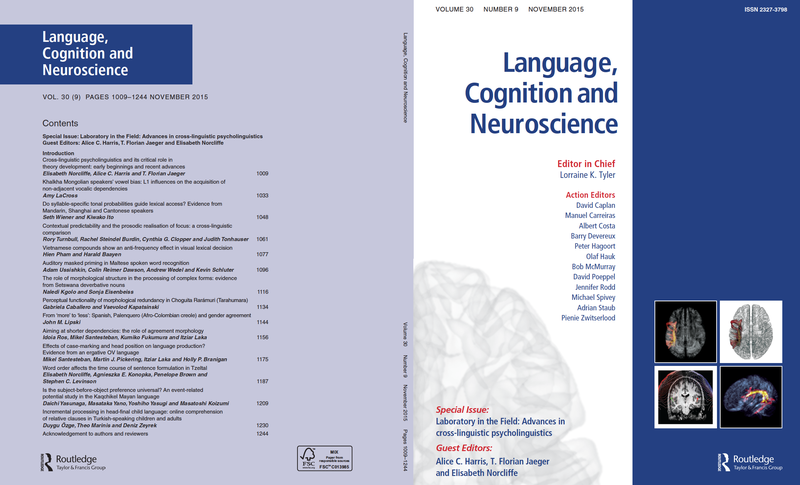 Language, Cognition, and Neuroscience just published Esteban Buz​’s paper on the relation between the time course of lexical planning and the detail of articulation (as hypothesized by production ease accounts). Several recent proposals hold that much if not all of explainable pronunciation variation (variation in the realization of a word) can be reduced to effects on the ease of lexical planning. Such production ease accounts have been proposed, for example, for effects of frequency, predictability, givenness, or phonological overlap to recently produced words on the articulation of a word. According to these account, these effects on articulation are mediated through parallel effects on the time course of lexical planning (e.g., recent research by Jennifer Arnold, Jason Kahn, Duane Watson, and others; see references in paper). 1C: Independent effects of phonological neighborhood density on both lexical planning and articulation. Production ease does affect articulation, but does not mediate the effects of phonological neighborhood density on articulation. This entry was posted in articles, Ever noticed?, Papers, Presentations, etc. and tagged articulation, hyperarticulation, lexical planning, lexical production, phonological neighborhood density, psycholinguistics.